Lip Service, Water Treatment, Raise the Bar and Oh My Aching... are the names for a new lacylike line of herbal bath and body care coming this month! It is thoughtfully handmade, organic (almost all of the herbs are grown locally) and all natural (meaning you could eat it but we don't recommend it). Lip Service - buttery lip balms that actually stay on and smell amazing! I've got them all over the house and Cliff loves it. I have a lip balm guy. Yours is sure to love them too! Our over the top faves are Tangerine and Lavender...oh well and Peppermint too. Water Treatment - bath salts and bath soaks. 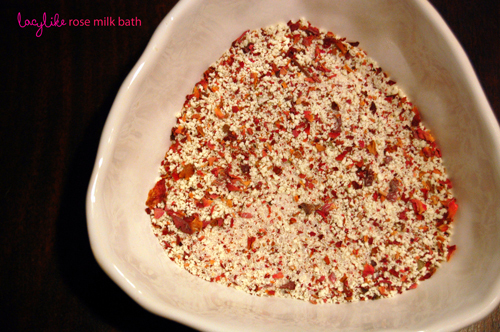 We've done a rose milk bath that is completely divine! Raise the Bar - bar soaps that have been Cody tested and approved. My little brother is the bar soap king and he's totally stoked (his words). 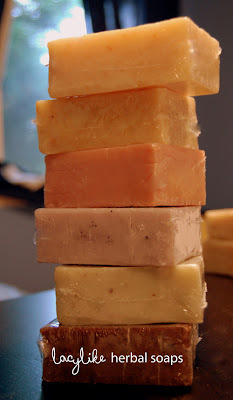 His fave is the Lavender & Orange Exfoliation Bar. Mine is the Cinnamon & Clove. Oh My Aching... is an arnica balm for sore muscles made with Arnica flower power! Soothing without being full of chemicals! Sorry Icy Hot. I am so excited to bring you this line, this is something I've always wanted to do! I hope it's going to become your go to staple when you need a lovely gift for a friend and for cultivating beautiful daily rituals for yourself (hello! Calgone take me away moments anyone!) It will of course be beautifully presented (because we all love great packaging and I LOVE the details) but after lots of talks with friends the consensus was it's what's on the inside that counts (ummm much like people) and the insides are ah-ha-mazing! Lacylike labels are in design process now. And I will bring you the full menu and more delicious details on Friday for the Love of Lists! Here's to doing something I've always wanted to do in the year of Fulfill! Super exited and I hope that you are too!